David Roth: Read any good overhyped pseudo-exposes this week? David Roth: I know, I can hear you. I think John Lackey eating a lot of Popeye’s is sort of the opposite of “scoop.” The tales of same are well-sourced and all that, but I already knew as much. Dude looks like a peevish curly-fry, so I could guess that much of what he eats falls under the “Golden Brown” heading. David Roth: I don’t think they should have written it or run it. Obviously people in the region wanted to read it, and the Internet loves to hate it, but the All The President’s Men ponderousness of it is vicious self-satire, for one thing. And the idea of the reporters calling Jason Varitek at home to ask him to confirm or deny the popularity of massive-multi-player gaming among the pitching staff is wince-city for me. David Roth: Also and more to the point, that whole thing could’ve been rewritten with a “these lovable rogues” slant if the team had won like two more games in September. Could’ve and would’ve been. David Raposa: Exactly. Imagine if Seattle or Baltimore’s sports journalists were as fixated on making sense of it all as Boston’s were. David Roth: Also, that story could probably be written about any team, right? The only thing that keeps us from knowing about a towel-clad, Old Crow-sodden Clint Barmes driving an ATV around the Astros locker room after games is the fact that no one cares to write about it. David Raposa: Except up here in the Northeast! David Roth: Presumably WEEI is calling for Congressional hearings? David Raposa: It’s really not so much All The President’s Men as it is some third-rate jingoistic conspiracy thriller starring Caspar Van Dien, F. Murray Abraham, and a former Suicide Girl. David Roth: Now that the Red Sox have managed to free themselves of the manager and GM that helped them win those two World Series, do you think they’ll finally be able to accomplish something? They want most what they can’t have: a World Series win against the Yankees. Achieved after going 162–0 against the Yankees. And sweeping the Yankees in every possible pre-Series playoff scenario a hyper-caffeinated Bud Selig can concoct. David Raposa: Gosh, I hope so! Going into the playoffs every year with nothing to show for it sure got stale! It was like being a Yankee fan. It’s actually kind of reassuring to see that the good old Red Sox Inferiority Complex is not only alive and well, but absolutely thriving. David Roth: I hate to put you in the position of soothsaying for a multi-state region of total maniacs, but what do Sox fans actually want? To win a World Series with Larry Bird, Casey Affleck and Carlton Fisk as co-GMs? David Raposa: They want most what they can’t have: a World Series win against the Yankees. Achieved after going 162–0 against the Yankees. And sweeping the Yankees in every possible pre-Series playoff scenario a hyper-caffeinated Bud Selig can concoct. David Roth: Including candlepin bowling and a contest to see which team “gets the most out of” the Sam Adams brewery tour. David Raposa: I would love to see a Yankees-Red Sox World Series of Competitive Eating, just to see what the posting fee would be to negotiate with Takeru Kobayashi. David Roth: I think Theo Epstein is really going to enjoy running the Cubs. Less demanding drunks in the stands, and Marlon Byrd and Darwin Barney swapped in for Ellsbury and Pedroia. Should be great! David Raposa: I love how Epstein’s legacy seemingly went from “breaking The Curse, building a de facto dynasty and establishing one of the best farm systems in all of baseball” to “lol Carl Crawford” after one bad month. David Roth: Totally. I think the Mets would be happy to discuss a Crawford for Jason Bay swap if the Sox were looking to get some more grit out there. David Roth: In terms of run production, Bay has been “too Belgian” with the Mets. Also, Erstad keeps in shape by running into his garage door at full speed for 45 minutes each morning. David Raposa: On the Theo tip, I am very much looking forward to that Lackey/Zambrano challenge trade. Boston wouldn’t mind having Z around: you’d have a built-in scapegoat for all clubhouse issues, and you wouldn’t have to worry about other players noshing on greasy grub between innings. David Roth: The only thing I am concerned about now, baseball-wise, is Tony La Russa getting back to the World Series. If that doesn’t happen, I’m pretty much good. David Roth: As long as they beat the Cardinals and spare me another couple weeks of La Russa’s Bruce-Jenner-pickled-in-vinegar self scowling through a pitching change, the Brewers can do whatever they want. Replace Yovani Gallardo with Governor Scott Walker. Add Latrell Sprewell to the postseason roster. Whatever, I will be in their debt. David Raposa: Meanwhile, Bruce Jenner looks like what would happen if you soaked Tom Cruise in egg drop soup and X-Acto knives for a year. David Roth: Why must we immerse our most admirable males in liquid? That is the thing that annoys me the most about America right now. That and LaRussa using four pitchers to get three outs and having a bench made up entirely of Nick Puntos. David Raposa: Don’t forget 5) Can play catcher when TLR uses his 3rd-stringer as a pinch-runner in the 5th inning. Are one-syllable first names also a pre-requisite, or am I confusing that with his 2B specifications? David Roth: Anyone can get those confused. You shouldn’t feel bad about it. David Raposa: It all comes back to hair. Cut off La Russa’s executive bowl cut and he turns into Stump Merrill. And Albert Pujols becomes Oscar Azocar. David Roth: Oscar Azocar! I remember having a Baseball Prospectus, and Azocar’s entry was all jokes about him. I’m pretty sure I’m not making this up. David Raposa: That sounds about right. David Raposa: Only a player with Azocar’s particular “skill set” could inspire such greatness. The only other guy that might have a comparable Laughs Above Replacement Player (LARP) is Sidney Ponson. David Raposa: If Kim Jong Il had such a pool, I’m pretty sure Sidney would just belly flop into that thing naked and drain it in about 45 minutes. While rectally inhaling 7–11 taquitos. David Roth: I’m quoting a United Nations resolution, here: “It is rare that the General Assembly votes unanimously on any measure, but we all just kind of get that Sidney Ponson can’t be trusted with a Ski-Doo, even under professional supervision.” That is why you can’t invite him to your house. Or nation. Royals fans already know this. David Raposa: I’ll just have to award him the key to the great city of Hartford via Skype. David Roth: So, what are the teams you actually want to see in the World Series? Mine are the Brewers and Rangers. But, like, the 1982 Brewers and the Rangers teams that were built around Rusty Greer. 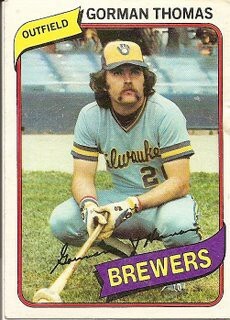 The 1980s Brewers were the greatest. They all looked like a different type of embarrassing stepdad. David Raposa: I get a kick out of those MLB promos that show Brewers past and present. Because when I think of those ’80s Brewers squads, I think of Yount, Molitor… and Don Sutton? David Roth: There is a lot I didn’t know about Gorman Thomas, apparently. Beginning with the fact that he 1) played CF on that Brewers team and 2) apparently loved trying to steal bases despite being built like a London Broil. David Raposa: He contains multitudes. In his handlebar moustache. David Roth: For his career, Gorman stole 50 bases and was caught 49 times! So he finished his career in the positive. That’s great. David Raposa: A caught-stealing’s as good as a 4–3 putout to a slow man. David Roth: His best seasons were the best seasons. I wish they still made .244–42–135 seasons, with 175 strikeouts, a .535 slugging percentage, and one steal against five caught-stealings. David Raposa: Well, he might not drive in as many guys, or run as poorly, but feast your eyes on The Future! Which is the near-present! David Roth: Ah, good point. Although Thomas wasn’t half the base-stealing threat (?) that Adam Dunn is. David Roth: He also “looks and runs like Will Ferrell.” Not that I’m mad about that. Watching sluggers Go Gelatinous is one of the great joys of following baseball over the long term. Miguel Cabrera is basically turning into a manatee before our eyes. David Roth: You still look healthier than Joe Buck sounds. And judging by the whuuut-is-happening face he makes after high-fiving Tim McCarver, Buck isn’t feeling that great, either. David Raposa: I dunno, Buck actually sounded somewhat engaged when Tito was in the booth. Maybe Tito brought along a pre-release copy of Arkham City? David Roth: Yeah, he was more awake than usual. I’m just worried about him, I guess. I think he should take a few years off. Twitter has already given us the spectacle of Buck traveling through time, underselling various historical events. He should focus on that. David Raposa: He needs to go DIY and make his own show. David Raposa: Animated webisodes. From the folks that made that Sports Guy cartoon. David Roth: Yes, more from the people behind the Sports Guy Cartoon, please. David Raposa: Would you rather the Anderson/Smoltz/Darling combo be responsible for promoting “Terra Nova”? David Roth: Buck does seem uniquely well-suited for that particular gig. David Raposa: From the minds that gave you “Skin” and “K-Ville”! This fall on Fox!